A closer look. Labels on the baskets are, from upper left, Swatches, Misc balls of yarn (the ones that haven't gotten put away yet into the Tower Of Stash, below), FOs, Yarn bras & bags, Tools – knitting, and Tools – other. That last basket is my version of a tool box — hammer, screwdrivers, etc. Sadly, I neglected taking before photos. Imagine that table in the first few pictures heaped with yarn, fabric, projects, swatches, patterns, and a hundred other things that are no longer there. The shelves that are now on the table came from a closet downstairs that is no longer being used much… last February. Then Smokey was in the hospital, then there was the campaign for county board, then there were all the summer parades and the fair, then emailing and organizing phone banks, then canvassing for the fall election, all the while knitting fingerless gloves for the farmers market and the craft fair, then it was Christmas. And then I did it. This entry was posted in knitting, Miscellaneous, Yarn. Bookmark the permalink. 0 Responses to The first deck I cleared. Job well done, and I like your carefully-worded title. Enjoy your ship-shape craft deck! Fantastic job!! Doesn’t that feel good? Beautiful. did you go out and buy all the wicker baskets (if so, where please) or were they just hanging around waiting to help you organize? Good work! That’s really impressive. That looks great! Now you have to keep it this way! Sensei! I bow in impressed acknowledgement of your superiority! I mean, it’s like you could be Martha Stewart’s best friend or something! I’m proud of you, too! 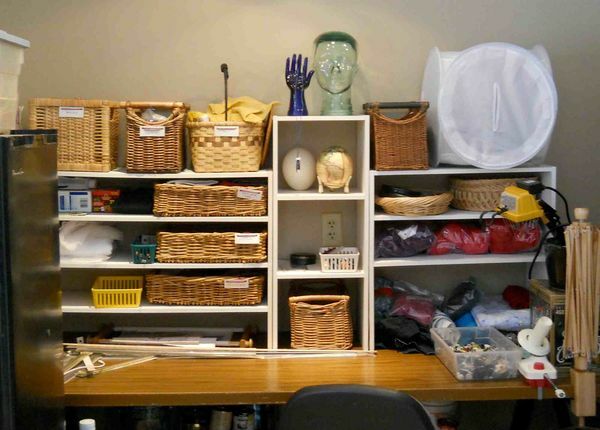 I just watched patternmaker Andrea Schewe clear out her sewing pencils and markers on her blog, so proud of the decluttering that’s going on. Well done. I really need to do some reorganizing in my office. Is that a wood swift you have? I’m thinking of putting one on my wish list. The old beat up plastic one is getting on my nerves.